Minister of State Zulkifli Massago’s was reported today(http://www.todayonline.com/Singapore/EDC111214-0000085/National-Servicemen-may-be-deployed-to-safeguard-rail-network–Masagos) as saying that , with the expansion of the MRT and the opening of 12 new Circle Line stations the Government was considering deploying National Servicemen on the front line to keep the nation’s public transport system safe. This strikes me as totally inappropriate even though the use of National Servicemen as cheap labour has gone on for some time. When they are deployed in this kind of security role it frees our government and the transport companies from having to recruit more volunteer security personnel who would have to be paid a market wage for their services. Our NS men are paid a fraction of what they would earn in a free labour market. This is admittedly somewhat better now than what I got when I was in the army. I still have fond memories of withdrawing $60 salary for one month and being looked at with disgust by the female POSB clerk (no ATM machines in those distant 1970s days!). In economic terms the deployment of NS men in public security roles amounts to a labour subsidy. There is a transfer of value from the NS men to the owners and operators of the transport network. Another indirect beneficiary, insofar as the provision of subsidised security services allows them to cut back on private security services, is the owner of the land above and next to the MRT stations and bus interchanges which in many cases will be the Singapore Land Authority or the government-linked property companies such as CapitaLand and CapitaMall. If the transport network was publicly owned then it could potentially be argued that this subsidy was returned to Singaporeans in the form of lower transport fares and/or taxes. However the transport companies and the property companies, with the exception of the SLA, are publicly listed. 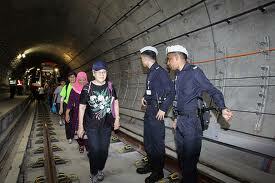 They may be controlled by the state directly, in the case of SMRT whose majority shareholder is Temasek. Or the government may exercise a shadowy control through the preponderance of ex-civil servants, Temasek directors and MPs on the board and the largest shareholder being an arm of NTUC. This is the case with ComfortDelgro. But they also have minority private shareholders. In a competitive market fares would fall by the full amount of the labour subsidy. However the public transport market is one of monopolistic competition. Part of the benefits of the labour subsidy, probably the major part, will go to the shareholders of the companies in the form of higher after-tax profits. So private shareholders benefit. It could be viewed as a form of regressive taxation since it transfers part of the value of the NS men’s output to well-off shareholders. Many of these shareholders are foreign and have not had to do NS. In addition in so far as the senior executives at SMRT and ComfortDelgro are able to pay themselves higher salaries as a result of higher profits due to the labour subsidy then this is another form of transfer from the less well-off to the better-off which would not happen in a free market. Even in the case where the increased profits go to the government’s coffers, they are more likely to go into the reserves rather than being redistributed to Singaporeans in the form of higher spending or lower taxes. And as I have repeatedly pointed out, most recently in the article You’ll Be Dead before You Can Spend It (http://sonofadud.com/2011/11/29/youll-be-dead-before-you-can-spend-it-singaporeans-enter-the-20th-year-of-unnecessary-self-imposed-austerity/ ), we are unlikely to get to spend those reserves. They are likely to continue to be used for empire-building but ultimately lousy investments. Alternatively some mechanism will be found to redistribute them to the debtor countries. One extreme is outright default but a more probable scenario is some form of below-market rate of return recycling of our assets. This will take place through multilateral institutions but be orchestrated by the principal debtor countries who rightly feel aggrieved that their consumption and overvalued exchange rates have swelled the current account surpluses of countries like Singapore, Japan, China and Germany. I challenge the government to prove that it has exhausted all investments in Singapore that yield a higher rate of return, even using purely financial criteria. Even if taxes are lower as a result of the forced labour of NS men the benefits also go to foreign workers and residents as well as women, who have not done NS. They also benefit the wealthier sections of the population given this government’s proclivity for cutting top tax rates while increasing indirect taxes such as GST. I am all in favour of low taxes but not where these are financed disproportionately by a subsidy from the less well-off. This redistribution of the benefits from the providers of the subsidy is equally true if by some miracle the companies behave as though the market is competitive and return the subsidy to consumers in the form of lower fares. Again foreign workers, tourists, PRs , the lucky foreign students whom our government woos with scholarships and then exempts from NS, and Singaporean women benefit while not having to bear the cost of the subsidy. One of the causes of the French revolution was resentment at the forced labour tax (the corvée) levied on the peasantry by the state. More recently countries like China were condemned by the West for using convict labour in a range of manufacturing industries. Not surprisingly this made them super-competitive in those areas. Both the Soviet and Nazi regimes benefited from the huge use of slave labour. When we deploy our NS men in roles in providing services to commercial companies we are doing the same albeit on a smaller scale. Even when our men are used purely for national defence, the savings from not having to pay a regular army leak to foreigners, new immigrants, foreign investors and women, all of whom do not have to bear the economic cost. That is why I have argued that NS needs to be reduced to one year immediately with a view to eventually phasing it out all together. In the meantime, or if this is viewed as undesirable on non-economic grounds, then those doing NS should be paid the full market value of their labour, either directly or indirectly in the form of lower taxes or free or subsidised medical care or further education. In the name of sexual equality women should have to do NS. And foreign workers, particularly those who enter on scholarships but are invited to stay on by our generous government, should do NS or pay higher taxes. I remember when NS was first introduced, the late Dr. Goh Keng Swee, said that it would be seen as fair because whether you were the son of a millionaire or a hawker, you would not be able to escape. We have clearly moved a long way from those ideals! It is time to see that the burden is lifted or that those who benefit pay the full market values of the subsidy. This of course, is if the NSFs are from the Army. If they’re from the police however, wouldn’t it fall under scope of duties? I do not advocate placing undue burden on NS men by giving them duties that fall outside their scope of service. Your main argument here, however, is based on the premise that NS men who provide security for public transport would be subsidizing the (semi-) private transport operators: ‘In economic terms the deployment of NS men in PUBLIC SECURITY roles amounts to a labour subsidy. There is a transfer of value from the NS men to the owners and operators of the transport network.’ (emphasis added) Based on your economistic approach, this premise is paradoxical: if the NS men are performing a public security role, then the benefits should accrue to taxpayers in the form of increased public security. It is debatable as to whether the public transport operators are obliged to, or if they even have the expertise and capacity, to provide that security role through their own purses. After all, their main role is to provide (supposedly) affordable and efficient public transport. Therefore, the idea that the NS men would be filling a role that the transport operators should be filling themselves is flawed. Furthermore, to say that NS men who are utilised for security of the public transport system are providing a subsidy through their labour is also flawed, as, in the first place, NS men are not providing services through a free labour market, ie. they do not have a choice as to whether they should provide that labour in return for their wages. Rather, they are compelled to serve whatever duties they are assigned by the state. The question, then, would be whether the threat to public security is great enough that the state has to activate NS men to fill that role, and that alternatives such as, say, using regulars or the police cannot fill that role better. Just as in the UK the rail industry pays for the British Transport Police so I assume our public transport operators pay for the security services they receive. If NS men are used then this is obviously at lower cost than if regular personnel were used. Either way certain groups who do not have to do NS benefit from this subsidy, whether it is shareholders in the public transport operators or foreigners using our rail system. The government will argue that if you want to pay NSman market rate, taxes will have to rise to pay for it (there’s no free lunch,they will say). Unless you can prove that reducing NS to 1 year will pay for the salary increment. That was precisely my point. NS can be regarded as a tax (in the form of labour that is not paid its full value). The tax burden should be shared equally. Either NS should be reduced or eliminated and replaced by a regular army that everyone pays for (or we find savings elsewhere in the defence budget) or women should be drafted as well, which would allow the period to be reduced to say six months. Also foreigners who have worked here after graduation at a local uni should pay a tax or be drafted if they wish to become PRs or citizens. It is not premature to start querying the pros and cons of deploying National Servicemen on the front line to keep the nation’s public transport system safe. But a more concrete evaluation can only be made when details of such deployment are released, in the interests of all concerned – which means including the man in the street. The fact that someone or some people have raised this issue can be seen as positive, as it may prod the govt to look at the drawing board from all angles to examine the pluses and minuses before proceeding with implementation. One aspect that jumps to mind, my mind at least, is that if, say, 500 National Servicemen are employed full time to provide security for the public transport system, it means that these same people [assuming they are all from the army] can be considered as redundant vis-à-vis defense deployment against external threat.